A free suicide prevention app called ReliefLink is now available on Emory iTunes. The app, which was originally developed in 2013, is designed to help people at risk maintain mental health on a daily basis, and keep barriers to accessing treatment at a minimum. Nadine Kaslow, PhD, Emory professor of psychiatry and behavioral sciences and president of the American Psychological Association, led the team responsible for developing the ReliefLink app. 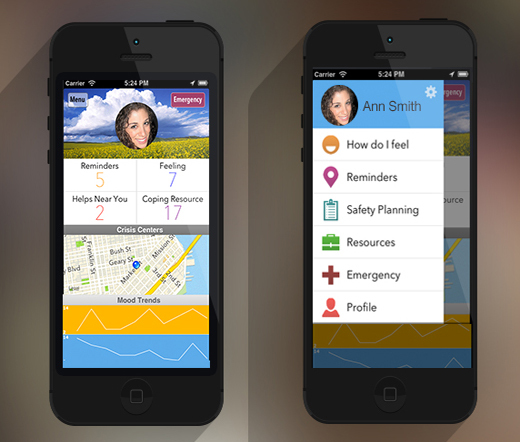 ReliefLink helps the user monitor thoughts and moods and develop coping and de-escalation skills, keeps track of medications and appointments, and provides an emergency button that alerts family members, practitioners and 911 during a crisis. Kaslow says she is very pleased that this app is readily available to the Emory community and believes that since technology is part of so many peoples’ daily lives, it shows great promise as an additional tool in the treatment of severe depression. "It’s like having your practitioner on your shoulder making sure you’re doing okay and sticking to your wellness plan." The most recent data from the Centers for Disease Control and Prevention (CDC) shows that suicide is one of the top 10 causes of death. Kaslow is confident that this application, combined with appropriate treatment, will ultimately help save lives, and reduce those statistics. ReliefLink won first prize in the Suicide Prevention: Continuity of Care and Follow-up App Challenge sponsored by SAMHSA (Substance Abuse & Mental Health Services Administration), which was presented to the developers at the White House in 2013. The ReliefLink development team includes: Stephanie Gantt Johnson, MA, mental health consultant and app team coordinator; Lu Dong, Emory psychology graduate student; Zhe 'Eric' Li, software engineer; Claire Lisco, MA, Georgia State University psychology graduate; and R. Shawn Williams, MFA, president of Williams Consulting, LLC.